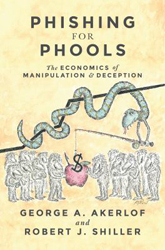 Phishing For Phools : The Economics Of Manipulation And Deception - ubiq bookshop: the best place to buy books! Ever since Adam Smith, the central teaching of economics has been that free markets provide us with material well-being, as if by an invisible hand. In this book, Nobel Prize-winning economists George Akerlof and Robert Shiller deliver a fundamental challenge to this insight, arguing that markets harm as well as help us. As long as there is profit to be made, sellers will systematically exploit our psychological weaknesses and our ignorance through manipulation and deception. Rather than being essentially benign and always creating the greater good, markets are inherently filled with tricks and traps and will 'phish' us as 'phools'.